I hate suffering. I hate it when someone – even me – comes down with depression, anxiety, psychosis; with an illness that is stigmatised and life-changing and will never fully go away. I hate all illness, sickness, death. I hate wars and famine and natural disasters. I hate the evil that man does to man, and the evil that happens for no reason at all. I hate it when innocents suffer – and I even hate it when I suffer for the things I have chosen to do wrong. I hate suffering. It shouldn’t exist. It is wrong. I have heard some Christians say that believers should not suffer – at least, that we should not suffer illness and disease. That those who do, are being punished. It is our fault if we have bipolar, schizophrenia, anxiety, or any other mental trouble. We are worse than others, we deserve it. A “proper” Christian is always joyful, never depressed; always calm, never anxious; always fearless, confident, in control. We should pray for forgiveness; not consult a doctor. We should repent; not take medication. Our suffering is merited – and we need to put on the sackcloth and ashes and plead with God to forgive our great sin, and take our illnesses away. 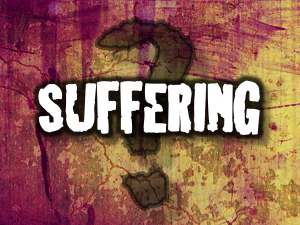 We all hate suffering – Christian and non-Christian alike. It shouldn’t exist. We all know that. It is easy for those of us who believe in a good God to say that if a person suffers they must deserve it. Much like those who say that if a woman is raped she must somehow have asked for it, we turn around and blame the victim of illness and tragedy. We try to make sense of why bad things happen to good people – and end up concluding that those good people are not good people after all, so it fits into our own personal narrative of only the bad being punished. It is not just other people who tell us these things – I have lost count of the number of times I have lain awake at night thinking that I must have done something to deserve this; that I must be a bad person, because God would not punish me if I were not. I have had the thoughts of, “I’m a bad Christian – if I had more faith/prayed more I would be healed.” I have had the, “if I only repent/repent more then it will stop.” The poison of these assumptions has slipped into my brain, even though I have not yet met a person in real life who has condemned me. The internet bears some blame – all the twisted theologies and words about God borne out of self-righteousness rather than love can be found there, and in illness, seem to make some sense. I am well: and with the rest from working that I have had over the past two years I have had time to think, to reflect. I do not, absolutely do not believe that my illness or anyone else’s is the will of God. If I say, I am being punished for my sin – then I am forced to confront the fact that, the minute I became a Christian all my sins were covered by the blood of Christ. I have passed from death to life and escaped the judgement for my sin – it is gone, blotted out, forgiven. There is no more need for punishment. If I say, I just need more faith/more prayer, and God will heal me – then I remember that Jesus talked about faith as small as the smallest seed making mountains move. I remember that every person has a measure of faith – you might have more than me, but I don’t think God is saying that if I do more, if I have more faith, then he will do things for me – I cannot earn God’s salvation, neither can I coerce God to do anything it is not in his will to do – however much faith I might happen to have. Perhaps I will never know “why” I was given an illness. Maybe I can make a guess – but neither I, nor anyone else, can claim to know the mind of God, can say to me that it was because of who I am. I can claim to have received blessings from my illness (faith, primarily) but I cannot – nor will I – claim that that makes it OK. God does not call evil “good” – that that includes saying that illness is really quite good, because good things came of it. He redeems, brings out from illness good things – but that never makes that suffering a good thing. To turn around to another who is in pain and say that it is God’s will, that it will be a good thing in the end – is cruel. Illness is wrong, suffering is wrong, and I do not believe that God will call evil good because he can produce good things from it – in the same way as he does not call unredeemed man “good” – even though that unredeemed man might become a Christian, that knowledge of our sin might bring us to faith – it does not mean that our original state was good because good came of it. I don’t have answers – and I don’t believe anyone else does either. We are stumbling in the dark when it comes to illness – and heaping pain on those already suffering strikes me as profoundly unChristian. I dare not tell myself that God is punishing me with illness – and I certainly dare not tell another what I think God is doing. Who am I to say I know the will of the Almighty? It may not be comforting to say “I don’t know why this is happening to me” – we all want answers – but it is the only conclusion I can come to. I do believe that God does not “like” illness, that he can use but does not approve of suffering. I believe that we should “rage, rage against the dying of the light” and do what we can to alleviate suffering, whether we do so through our compassion, medicine and/or prayers. One more thing that I picked up from Job is a timely reminder of Who we have in heaven. Our Friend, our intercessor, the one in whom we trust, and in whom we have our hope. When all else is lost and there are no answers, only pain, in the end, it is him we have to rely on, not our own fumbles in the dark, trying to figure out answers we can never know.